← What’s the Housing Market in Lake Oswego Look Like for 2019? January is Soup Month and there are plenty of restaurants in Lake Oswego that can help you celebrate. From a legendary creamy mushroom version to an authentic Vietnamese pho, you’ll find the variety, warmth, and taste that makes soup a natural dining choice in the midst of our cold, wet winter. GUBANC’S RESTAURANT. While this third generation owned and operated restaurant features daily selections made fresh from scratch, the Cream of Mushroom soup that is serve d up every Friday is considered legendary. It dates back to one of the original owners—Anne Gubanc—who was known for her delicious creations and this one has stood the test of time. Recent Yelp reviews call it “to die for.” Check their website for this week’s lineup of soups. 16008 Boones Ferry Road, 503.635.2102. FLYING ELEPHANTS DELICATESSAN. Elephant’s Delicatessen has had a Lake Oswego presence since 2005. They feature monthly soup specials (like Indian Spiced lentil and Mulligatawny) but are often lauded for their classics: Tomato Orange and Mama Leone. Several Yelp reviewers attest to combining the two for a true gastronomic delight! If you’re feeling industrious, you can follow the recipe for their Tomato Soup and make it at home. 5885 SW Meadows Road, 503.620.2444. LA PROVENCE. The signature soup here is French Onion featuring deeply caramelized onions in a rich homemade beef consommé. Top it with melted Swiss and Parmesan cheese on toasted bread and you may feel so warm and cozy inside you won’t want to leave! One Yelp fan described it as a “rich brown homage to the humble onion with a thick beret of melty cheese.” 16350 Boones Ferry Road, 503.635.4533. PHO’ LAVANG. Pho is Vietnam’s national dish and this family-owned Vietnamese restaurant does it justice. The rich, aromatic broth is filled with vegetables, rice noodles and your protein of choice from steak and chicken to shrimp and barbecue pork. 16120 Lower Boones Ferry Road, 503.697.6253. POT BELLY SANDWICH SHOP. Want your soup served your way? You can customize your order here by adding ingredients to your soup. Add-ins include avocado ($1.25 extra), bacon (75¢), cheddar (65¢), jalapeno crisps (60¢), pot pie topping (60¢), or onions. Selections include Chicken Pot Pie, Loaded Baked Potato and Broccoli Cheddar. 9 Centerpointe Drive, 503.840.6974. TAVERN ON KRUSE. Priding themselves on their use of seasonal ingredients, you can enjoy Apple and Butternut Squash Soup here right now as well as Steamer Clam Chowder. 4835 Meadows Road, #133, 503.303.5280. ZUPAN’S. Want to grab and go? Zupan’s rotates their daily selections and label whether they are gluten and/or dairy free. There are six to choose from with recent selections like Turkey Lentil, Steakhouse Beef Vegetable and Wild Salmon Smoked Chowder with Bacon. Call in and ask for the deli to get that day’s lineup. 16380 Boones Ferry Road, 503.210.4190. 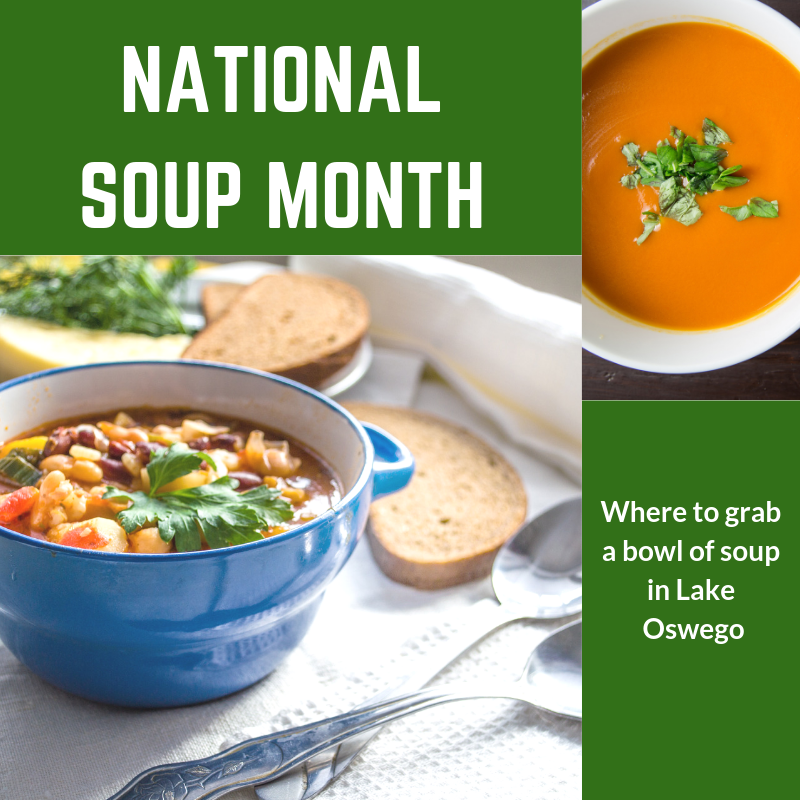 This entry was posted in Lake Oswego Restaurants and tagged Lake Oswego Restaurants, National Soup Month, soup in Lake Oswego. Bookmark the permalink.